Monthly meetup TechTO is an outlet for founders and startups to engage in open conversations about their entrepreneurial journey. 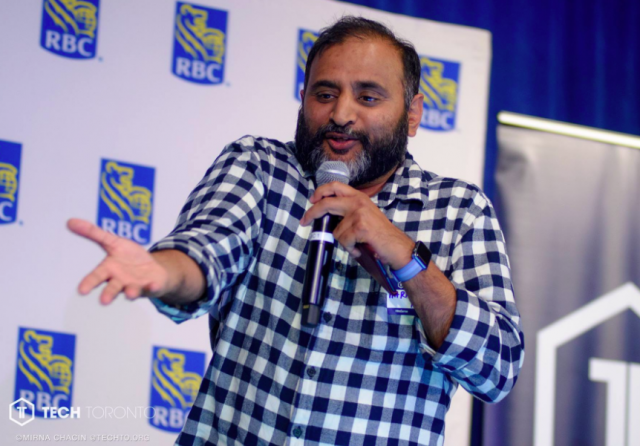 At the latest event, Harinder Takhar, CEO of Paytm Labs, shared tips from his story. Takhar started the consumer brand of his business, Paytm Labs, in 2011 with a board that was vehemently against the idea because they hadn’t seen a single business transition from B2B to B2C. Today, he runs a company that has 4500 employees and has just approved approximately $10 million in monthly marketing budgets. In an evolving system where B2B companies are now simply referred to as consumer businesses, Takhar is not afraid to break the rules. With experience working in a variety of areas including telecommunications, marketing,and now financial services, Takhar recently opened a Toronto office dedicated to data sciences and launched a Canada app in March. Takhar reminds startups over and over again that success is dependant on ambition, not just knowledge. “I told you earlier that we are a 6-year-old company, we had no idea about payments or financial services when we started. I confused the acquirer and issuer words in the earlier part of being the CEO of Paytm. Can you imagine that I was running a payment company and I didn’t even know what a processor was,” he said. According to Takhar, your priorities decide what you will become and speed should be a priority for all startups. The first person he hired that had experience working with credit cards was in February of this year and two months ago Paytm launched its credit card in India.